It all started one day sitting in traffic. On the way to and from work and the little trips out for this or that, I had passed by the local arts center for many years and had assumed it was a daytime operation. On this particular day I noticed that there was a Show and Sale on Saturday and Sunday. I went home and told my wife that we should go. We went on Saturday and saw a lot of art work, some good, some obviously beginner work. 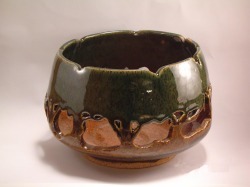 The BIG surprise was that the Arts Center has evening classes in wheel pottery. I took home a schedule of classes to study and the next week I signed up for the next Beginner Wheel Pottery class. The sale was in November and started in the class the following January. That was in 2004. At first I found wheel pottery frustrating. I even threw in a watercolor painting class between the first and second wheel pottery class, but the draw was still there and I found myself in front of a potters wheel again. After completing the second beginner class, I signed up for Altered Wheel Pottery to explore something beyond the basic shapes. That class sealed my fate to become a potter for life. I am always amazed at the versatility of clay. It can be manipulated into useful objects for everyday life or into a representation of almost anything one can imagine. It even can be made into objects to protect astronauts coming back to earth from space. This versatility and the universe of objects that can be created using clay and the imagination is what keeps me interested. Most of my pottery is thrown on the potter's wheel. Some pieces stay close to the original form, others are altered with changes in texture, shape, or with additions to change the look and feel of the pieces. Others are made into representations of figures or creatures that I find in the manipulation of the clay. Some pieces are more like paintings; made from flat slabs of clay that are carved, textured and painted in vignettes of things I like in our world. All are intended to evoke an emotional response, be it a laugh or chuckle, or some other, deeper, feeling. I sincerely hope my work brings you joy, as that was what it has brought me in the making. I am proud to be a member of the Potters Council.